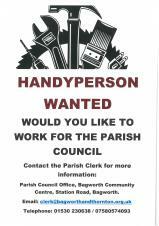 A co-option vacancy has arisen within the Parish Council for the Bagworth Ward. 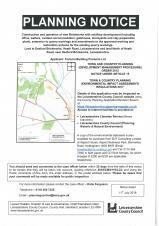 This vacancy is open to residents of Bagworth, Thornton & Merry Lees. For further information or to register your interest, please contact the Parish Clerk. 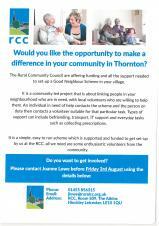 The RCC are offering funding and all the support needed to set up a Good Neighbour Scheme in Thornton. An electronic brochure packed full of summer holiday activities for young people in Hinckley & Bosworth can now be downloaded from the Borough Council's website. The in-depth guide to 'What's Going Down' this summer is a free 74-page electronic booklet aimed at 0-19 year-olds and is packed full of information that is sure to keep them busy during the school holidays.